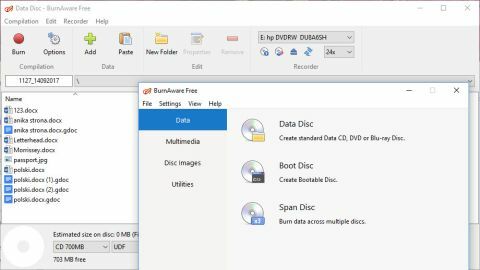 Although this free disc burning software may seem a little limited to start with, you should find that it meet all of your basic needs – and a little more too. Although BurnAware Free is, well, free, it doesn't scrimp on features. There's support for CDs, DVD, Blu-rays and dual-layer media, and you can create data, music, video and bootable discs, as well as working with images. This isn't an unusual feature set for a free burning tool, but BurnAware makes everything so accessible and easy that it feels like more than the sum of its parts. If you need more features, such as disc-to-disc copying, multiple drive support, and CD ripping, you have the option of upgrading to the Premium or Pro versions. For most people's day-to-day burning needs though (and probably beyond) the free edition should be just fine. While the installer doesn't try to sneakily install extra software, there is an optional program offered at the end of the installation that you'll need to watch out for and decline – unless you really want it, of course. The first thing you'll notice about the BurnAware interface is that it is very clean – clean to the point of sparsity, some might say. This has the dual effect of making the program easy to get around, but also makes it feel simplistic. But it's not – just very well laid out. Whatever tasks you want to complete, it's easy to drill down to the right section and each element is self-explanatory. The way the program opens a new window for just about every task you start is slightly annoying, but it's not enough to detract from an otherwise great tool.